The company that has been rated second is located on the left bank of river Godavari in the pilgrim town of Rajahmundry, East Godavari district, Andhra Pradesh. Not that Andhra Pradesh Paper Mills Ltd's ( appml 's) environmental performance is extraordinary. But it shows consistency. The mill is ranked above average in several departments. appml has also been regularly making profits. The company has taken an initiative in framing an environmental policy statement, though this is very general in nature. And it came about as a result of cse 's questionnaire. The company has a specific environmental department with an established organisational structure. The department is headed by a manager who reports directly to the vice-president (works). In terms of raw material, appml primarily relies on farm forestry, which accounts for 80 per cent of its fibre consumption. But the company also gets bamboo from natural forests from neighbouring states and from the Northeast for the remaining 20 per cent of its fibre requirements. The fibre-use efficiency of the company is comparatively higher than most Indian mills of a similar type and, importantly, it is showing improvements. Though it has taken some initiatives to reduce its energy consumption, these efforts are not reflected in the mill's energy performance. The company's per unit energy consumption figure stands at 41.51 giga joules, which is closer to the worst in Indian mills of its type. But the overall trend in energy consumption is registering a decrease. What is most noteworthy is that that the mill is perhaps the only one in India that discharges effluent upstream of the point in the river where it draws water. So, if the mill does not meet the prescribed standard, its water supply would also be affected. But appml 's per unit water consumption is high: 210 tonnes - close to the Indian average of 250. 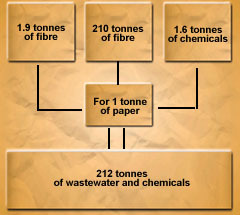 A mill of appml 's type and size can achieve as little water usage as 60 tonnes for each tonne of paper produced. The company's use of chemicals is worrying, except for the use of elemental chlorine, the use of which has declined. The per unit use of caustic soda stands at 207 kg, which is more than double the maximum of 100 kg according to the rating criteria. The mill has installed a kiln to recover lime from the sludge that is left after chemicals are recovered from black liquor. There has been an overall decrease in the company's consumption of chlorine and lime. The mill does have a che-mical recovery system. The company's effluent treatment plant is better than those installed by the average Indian pulp and paper mill. The company has replaced two coal-fired boilers with fluidised bed combustion technology. While the former relies only on coal, the latter can use a diversity of fuels. However, a recurring complaint of the people of the nearby town is the foul smell that emanates from the mill, especially in humid weather conditions. It has to be noted that the mill is poor at disposal of fly ash, monitoring and research and development. India's best mills will have to value their resources even more to improve their environmental performance.